We recently received notice of an upcoming event in Colonel Summers Park. Read on for details. On the theme: Together we discover the Buddhist tools to transform our hearts. Domyo Burk of Bright Way Zen gives the keynote talk of the day. Domyo was ordained at Dharma Rain Zen Center, and continues the nurturing of the Dharma with a new community on Portland’s west side. Four panelists from various traditions will discuss the theme of “Transforming the Heart” and respond to questions from the audience. While the Dharma talk and panel discussion occur in the park’s main shelter, the children’s pavilion will be busy with story times, crafts, and other activities. Activities for children and adults come together in a Ceremony for Transforming the Heart, with blessings for people and pets. Participants may offer incense and receive blessings from ordained Buddhists. Many different Portland area communities will be represented at the booths. Pure Land, Zen, Vajrayana, Vipassana, and non-sectarian groups will share news and information about their communities. The festival is free, and all are welcome. Organizers ask for mindfulness regarding waste. 3:00 pm: Panel Discussion: Stan Shiigi, Oregon Buddhist Temple; Heidi Enji Hoogstra, Dharma Rain Zen Center, BPF Portland; Sakula Mary Reinard, Portland Friends of the Dhamma; Prajwal Vajracharya, Dance Mandal. The Commission has received a petition requesting the amendment of OAR 845-005-0331 Licensing Exterior Areas. The petitioner is the City of Portland. The petitioner requests to amend this rule by adding a new section (6) regarding licensed premises that are exclusively outdoors. The proposed language would prohibit issuing an annual license to such a premises, but would allow for the issuance of a temporary sales license. A copy of the petition may be obtained by contacting Jennifer Huntsman, Rules Coordinator at 503-872-5004. The petition is also viewable on the OLCC web site: http://oregon.gov/OLCC. Go to the Laws and Rules button, then follow the link to “Current Petitions Received”. For questions, you may contact Jennifer Huntsman, Rules Coordinator, by email (address above) or call (503) 872-5004 (or toll free within Oregon: 1-800-452-6522). This notice is OLCC’s invitation for public comment on the petition, including comment on whether options exist for achieving the rule’s substantive goals in a way that reduces negative economic impact on business. You may email, fax or mail your comments, but all comment for the record must be in writing. A street party is tentatively planned for Burnside and SE 16th on Friday, June 1st, during the morning and afternoon commute times. The purpose is to highlight the need for a safe crossing at this location for pedestrians & cyclists, including residents and students of Buckman Elementary, Central Catholic High School, Da Vinci Middle School, & Benson Polytechnic High School. Crossing enhancements are planned by the city in the next two years, but highlighting the need can help ensure there is follow through on the plan. 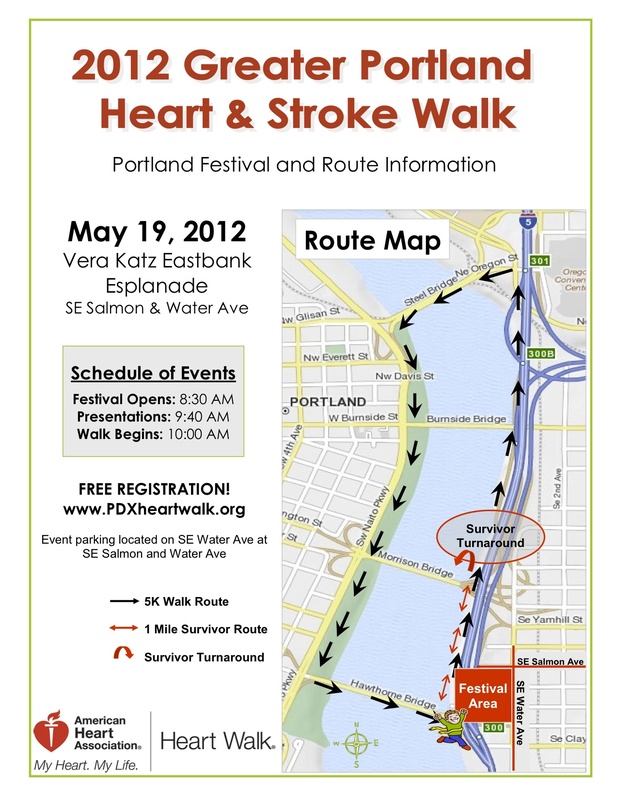 On Saturday, May 19, 2012, the American Heart Association will hold its Annual Heart & Stroke Walk. Approximately 5,000 participants will gather at Vera Katz Esplanade to make the 5K walk. See below for a route map. The Office of Neighborhood Involvement Crime Prevention Program and the Portland Police Bureau will hold a Prescription Drug Turn-In event on Saturday, April 28th from 10:00AM to 2:00PM at three locations in the City of Portland. Event: Prescription Drug Turn In. This is a free event. Look for the Portland Police Bureau mobile precinct in the parking lot next to NE 102nd Avenue. Portland Police Officers and Crime Prevention staff will be onsite for the anonymous turn in of unused or expired prescription medications, to share information about the dangers of prescription drug abuse, and to answer community and media questions regarding this issue. All medications will be incinerated. Please consolidate all pills by putting them into a sealed sandwich baggy if you have a large amount to dispose of. Make sure that liquids are in a tightly sealed, leak proof container. NO SHARPS! Acceptable items for disposal: Prescription medications and samples, all over the counter medications, vitamins, pet medications, medicated ointments, and liquid medication in leak proof containers. Items not accepted: Thermometers/Sharps/Syringes, IV bags, bloody or infectious waste, hydrogen peroxide, aerosol cans, inhalers, EpiPens. We recently received an e-mail from the city about the upcoming expiration and renewal of all liquor licenses for establishments south of Burnside. This is your opportunity to provide input to the Oregon Liquor Control Commission (OLCC). Read on for details. All liquor licenses South of Burnside within the Portland City Limits (East &West) will expire on July 1st, 2012, unless renewed by the Oregon Liquor Control Commission (OLCC). As part of the renewal process, the City of Portland makes recommendations to the OLCC on renewal applications using information gathered from neighbors, community organizations, and public safety officials. The City of Portland is home to approximately 2,900 liquor license establishments, about half of which are coming up for renewal. Neighbors, Neighborhood and Business Associations, and Community Organizations have a very important role in this process. The annual renewal is an opportunity for communities to address problems or concerns with licensed establishments in their neighborhoods. Concerned neighbors and community organizations wishing to oppose a license renewal south of Burnside should advise the Office of Neighborhood Involvement as soon as possible. Licensed establishments not identified by the City of Portland as problems are processed as though they received a “favorable” recommendation. Opposition received by individuals and organizations is considered by the City before a recommendation is made to the OLCC. If neighbors have concerns but do not wish to formally oppose the license renewal, this is an excellent opportunity to engage in problem solving to address concerns informally. Information about liquor establishments with ongoing problems must be received by May 15th, 2012. Please contact Theresa Marchetti, City of Portland Liquor License Specialist, at 503-823-3092 or theresa.marchetti@portlandoregon.gov. You are currently browsing the Buckman Voice blog archives for April, 2012.